When it comes to buying stocks, I’m a bigger fan of buying things that are already working rather than getting cute and trying to be the first one in hoping others agree with me quickly. Rarely does bottom-fishing work out in our favor. The probabilities are against us from the start. One way to see if something is already “working” is to recognize how it’s behaving compared to its peers. In the case of U.S. stocks, how are specific groups doing compared to the rest of the market? I like to think of it like holding a basketball in a pool underwater. You can feel the pressure, similar to overall selling pressure in stocks. Once you let go, the ball explodes out of the water and into the air. Stocks behave the same way once the overwhelming selling is complete. An interesting space we’ve been watching is in healthcare. 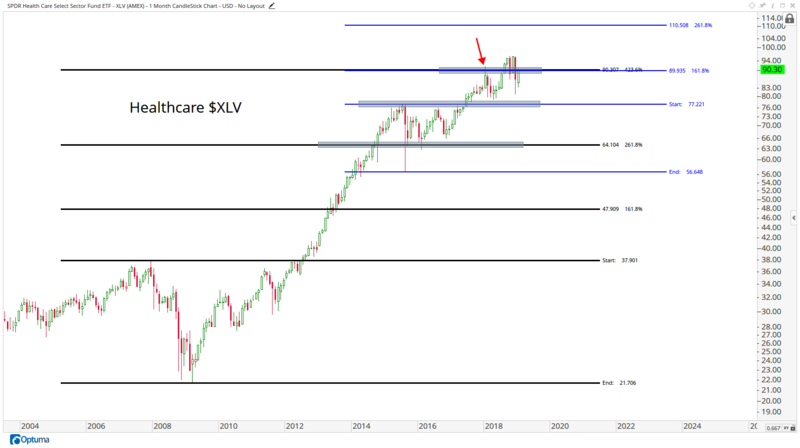 This is a monthly chart of the Healthcare ETF (NYSEArca: XLV) that stood out during my end-of-month work and I think it really shows how well this space has held up. If we’re above $90, we need to have long exposure in the healthcare space. This level represents a cluster of important extensions based on both the 2007 and 2015 corrections. There are a few names in particular that stand out from a structural perspective. By “structural” I mean that these are longer-term charts with longer-term horizons and certainly not swing trades, or god forbid day trades. 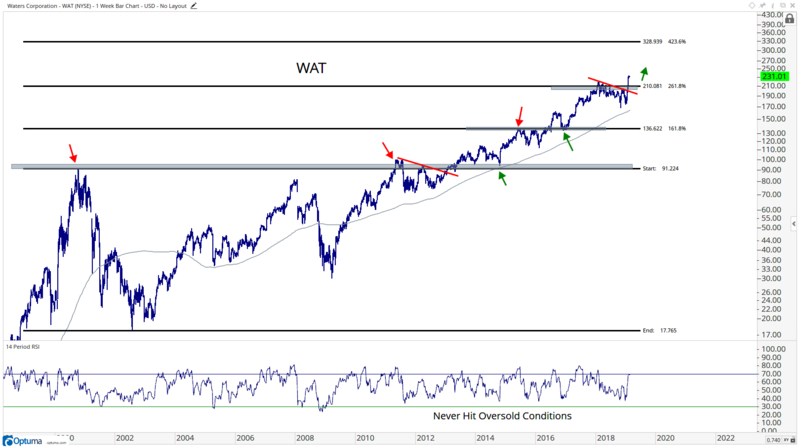 These are the types of stocks we want to be buying on weakness and/or after consolidations. The first one is Waters Corp. (NYSE: WAT) making all-time highs. The one thing we know about new all-time highs is that it’s not characteristic of a downtrend. 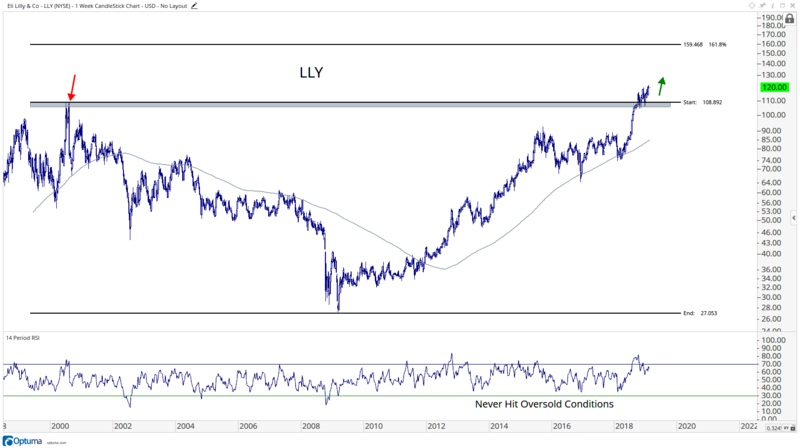 The second one is Eli Lilly (NYSE: LLY) also making new all-time highs. If we’re above those former highs from the summer of 2000, we want to be in this one from the long side. The next upside objective is near $150. I like the risk versus reward in these stocks. The strength in the sector and sub-industry level certainly stand out. That’s exactly what I told Breakout Profits subscribers this morning when I recommended another healthcare stock play, with clear risk-management instructions. In the fourth quarter, U.S. stocks got hit hard. We saw huge corrections across many different sectors. It’s during times like these when we want to look for stocks and sectors that are showing both relative strength and are remaining in a bullish momentum range. These tend to be the first ones to break out once the selling pressure in the overall markets has dried up. The stock market is a sideways mess right now. But I believe there are good opportunities within individual names. I HATE to say, “It’s a stock pickers’ market.” I really do hate that. But it is.